When you’re trying to improve quality and productivity, it’s essential to target the right problems, get the right people involved in solving them, and make sure the solutions work. CEDAC will help you do all three. CEDAC, or Cause-and-Effect Diagram with the Addition of Cards, is a modification of the “fishbone diagram,” a standard QC tool. 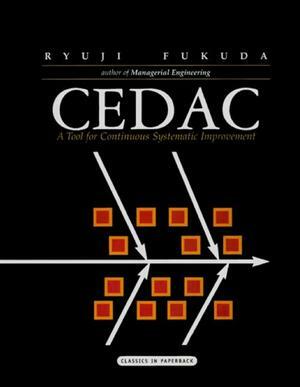 One of the most powerful, yet simple problem solving methods to come out of Japan (Fukuda won a Deming Prize for developing it), CEDAC actually encompasses a whole cluster of tools for continuous systematic improvement. Window analysis for problem identification. The CEDAC diagram for problem analysis and development of standards. Nearly 50 illustrations and sample forms suitable for transparencies. Window development for ensuring adherence to standards. Here, in his own words, is Fukuda’s how-to manual for the in-house support of improvement activities using CEDAC. Previously available only to his own clients, it provides step-by-step directions for setting up and using CEDAC. With a text that’s concise, clear, and to the point. The manual is an ideal training aid. Written by the industrial engineer, Dr. Shingeo Shingo, who developed SMED (single-minute exchange of die) for Toyota, A Revolution in Manufacturing provides a full overview of this powerful just in time production tool.